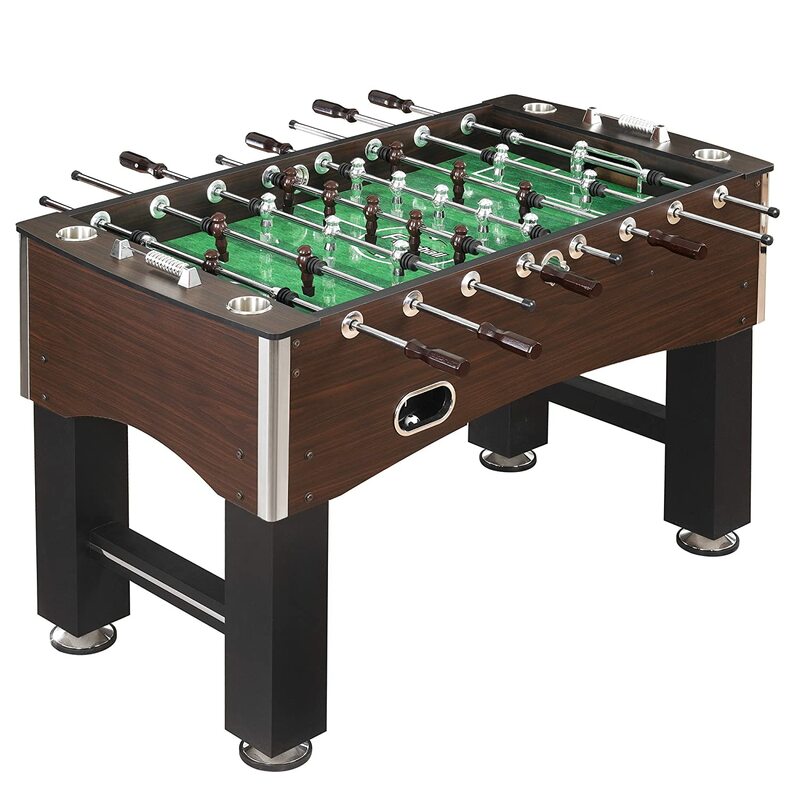 What are the Best Foosball Tables? Foosball is a very popular arcade game beloved by people of all ages. They have become a popular item for home game rooms throughout the years and can benefit your children in many ways. 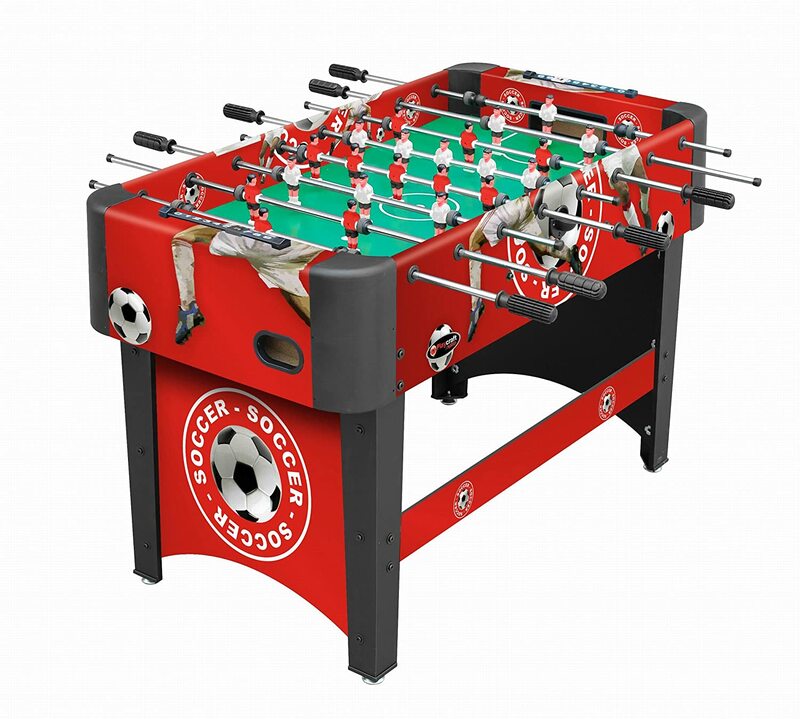 The best foosball tables will not only provide your child with entertainment, but allow the family to come together and bond through play, teamwork, and quality time together. This provides parents with an opportunity to teach, lead, and coach their child while having fun at the same time! Other ways that foosball benefits your child is by teaching them sportsmanship, patience, and cognitive strategic thinking. Physically, foosball can help to enhance and develop your child’s hand-eye coordination, reflexes, and agility. Foosball requires physical and mental effort, helping your child to learn and grow as they play! Foosball tables are no longer restricted to just a game room. 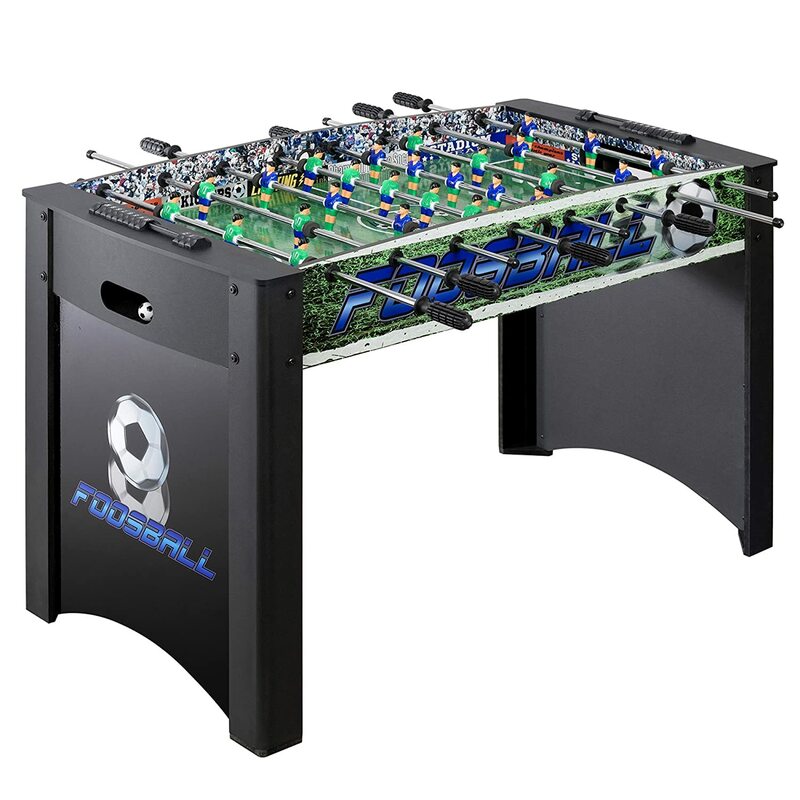 Many foosball tables are designed to be placed on top of a table, which allows you to store the game in a closet or other space when not in use. Some foosball tables even fold away. 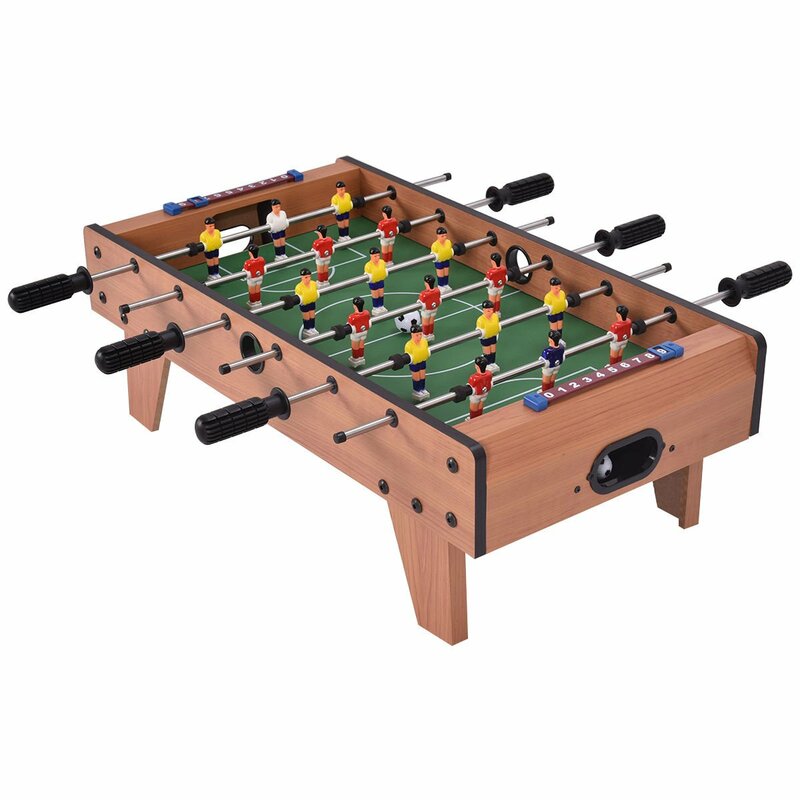 They are available in many different sizes and heights, and span a wide variety of budgets, making it easy to bring foosball fun into your home no matter the obstacles! 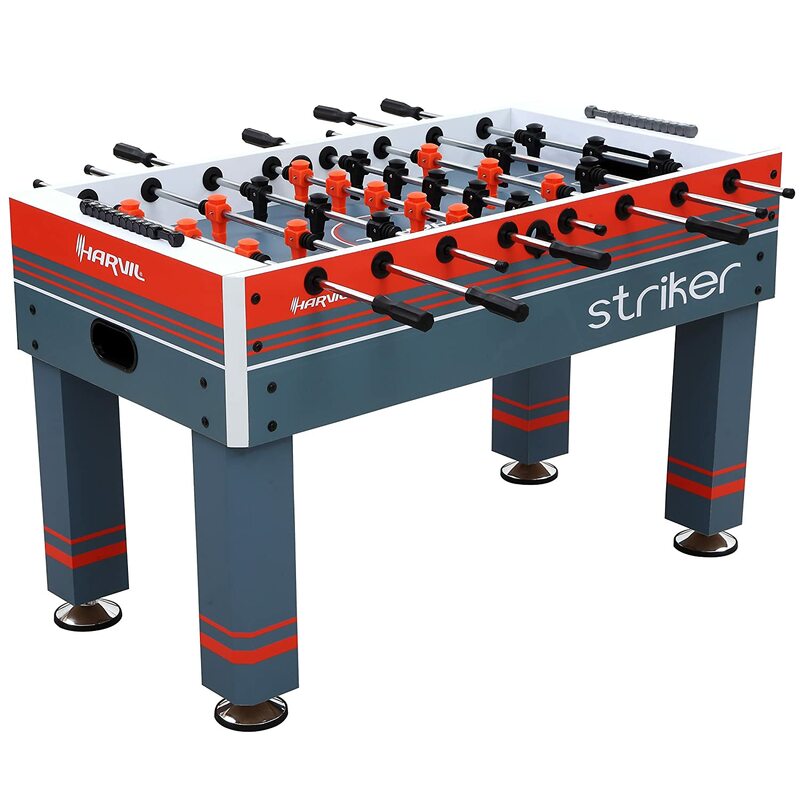 We’ve chosen the best foosball tables based on quality, ease of assembly, and convenience, all while taking any budget size into consideration. 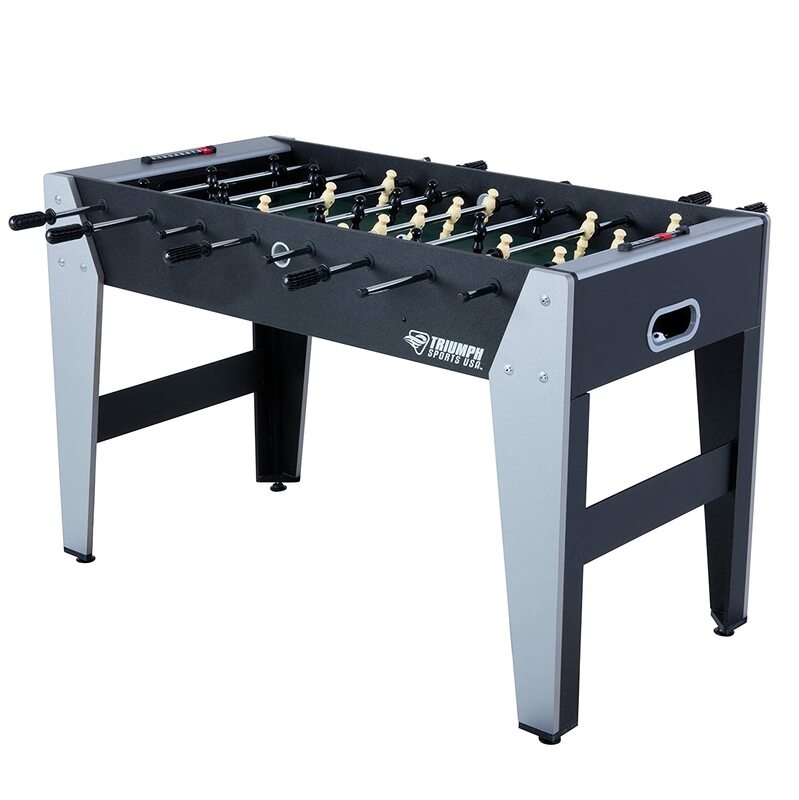 We have also considered a wide age range by including foosball tables that are suitable for young children all the way through the teenage years that parents can enjoy as well! 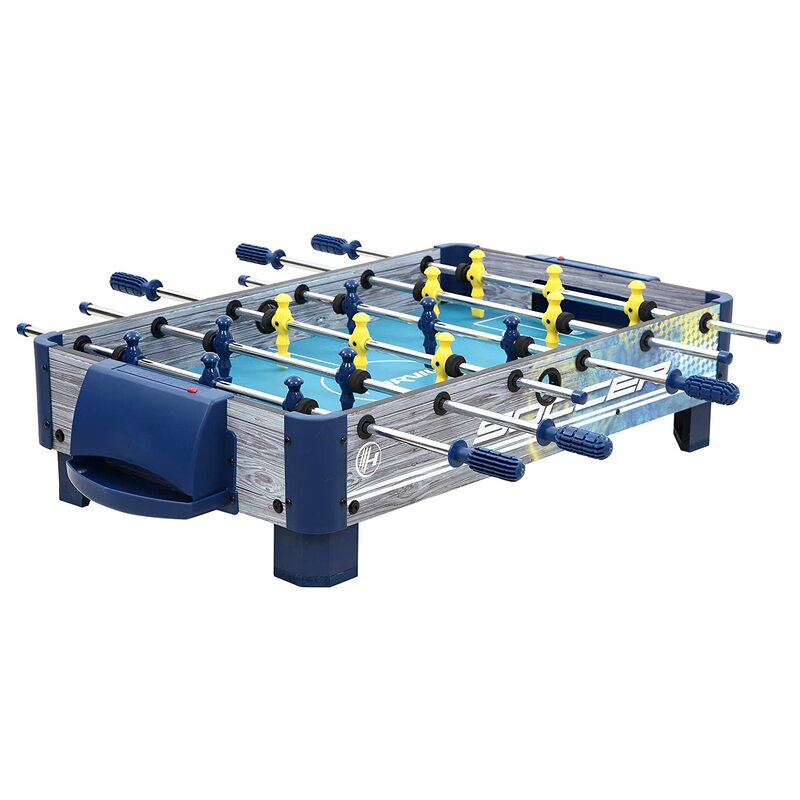 This tabletop foosball game from Harvil is compact and lightweight and has a bright, vibrant design and modern graphics intended to engage children in the game. This unit has 16 blue and yellow players with a 3 goalie configuration. The silver steel rods have non-slip rubber handles for easy and comfortable gameplay. Built-in manual scoring units help your children keep track of their score as the game progresses. Two foosballs are included with the unit. 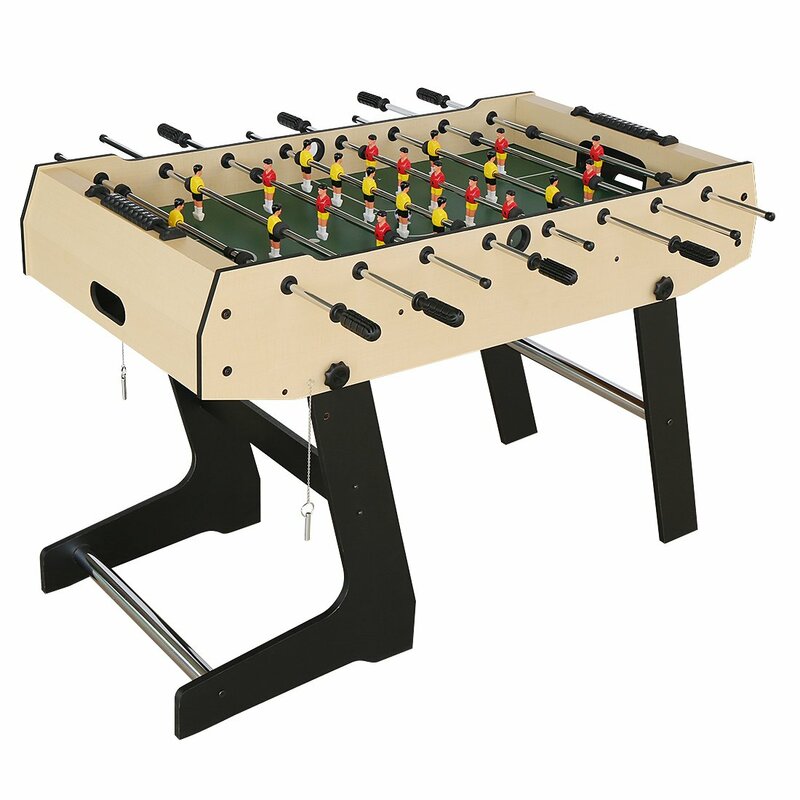 Playcraft Sport offers this 48-inch foosball table with an exciting and realistic soccer field and crowd graphics. It’s strong and durable MDF construction with unified leg panels and leg spanners, and, chrome plated leg levelers make this table last through hours of rough play. Chromium steel rods with slide bearings allow for smooth rotation and control during gameplay. Included with this table are two internal ball retreivals at either goal, plastic manual slide scorers at either goal and 3 foosballs. 22 players with a 1 goalie configuration increase the challenge level with this game. 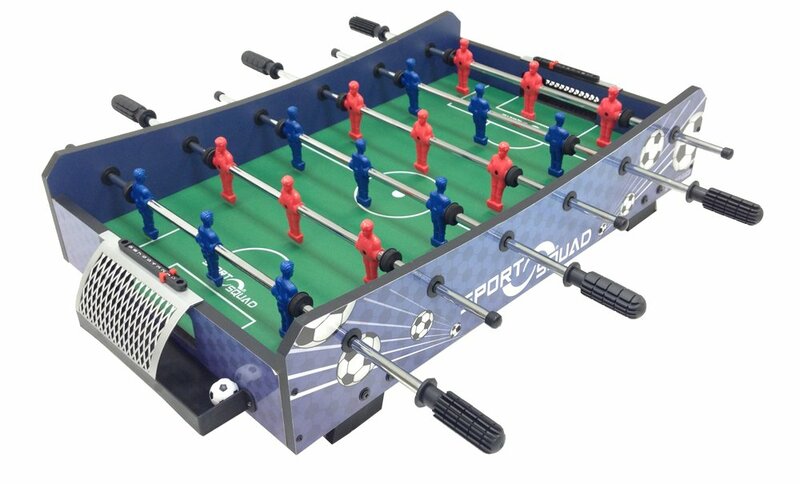 The Sport Squad FX40 is a great table-top foosball game for kids of all ages. It features realistic graphics and foosballs, compact dimensions for convenience and portability, ball-return goals with plastic sliding manual scoring systems, and a 3 goalie configuration. The rods are plated steel and have ergonomically designed rubber handles that fit comfortably in your hand. The playing field is made from strong MDF board, and the table has L-Shaped legs for greater stability. If you’re looking for a table with realistic graphics and features, this one is for you! The screen-printed graphics reflect the look of a real soccer field, including a crowd of fans to cheer your kids on! Even the players are designed with a realistic look. The foosballs are painted with traditional soccer ball colors and hexagon patterns. This sleek, modern table gives a youthful vibe. Chrome plated steel rods with ergonomic rubber handles give players a comfortable grip and smooth control. The table features a manual sliding scoring system and automatic ball return. This table’s features aren’t too fussy: screen printed graphics, a simple and modern design, and two included foosballs are all you need to enjoy a great game! It has a manual sliding score system, three goalie configuration, and ball retrieval pockets. Solid legs with levelers, side and end panels, and steel rods with deluxe bearings provide maximum durability for hours of rigorous play. This is the smallest foosball table on our list. At just 27 inches, this tabletop game is perfect for travel and for small spaces. It’s smaller size also makes this table more suitable for younger children. It can fit on top of almost any table, coffee table, kitchen island, you name it! A simple wood design with a basic playing field and realistic players and soccerball-style foosballs. Solid steel rods offer smooth control of the players. This table has a sliding score system and ball pockets at either goal. HLC’s 4-foot table offers a unique feature: it folds upright. This allows you to push the table against a wall, into a corner, or into a closet when not in use. This table brings a simple look with a wood grain laminate finish and beautiful espresso finish legs. The L leg design and cross support beams ensure optimum stability during gameplay. Stainless steel rods with E-Z spin bearings and counterbalanced players allow for smooth control and fast-paced play. The one goalie configuration increases the challenge level with this foosball table. The best part? Fold-out cupholders! The Triumph Sweeper has a very hip and edgy look which is great for your teens and preteens. It offers a very simple design with a three-goalie configuration, ball retrieval pockets at either goal, a sliding score system, and included foosballs. It’s made froms solid wood and has L-Shaped legs with levelers for stability. The hollow chrome plated steel rods have ergonomic grips for comfortable play. 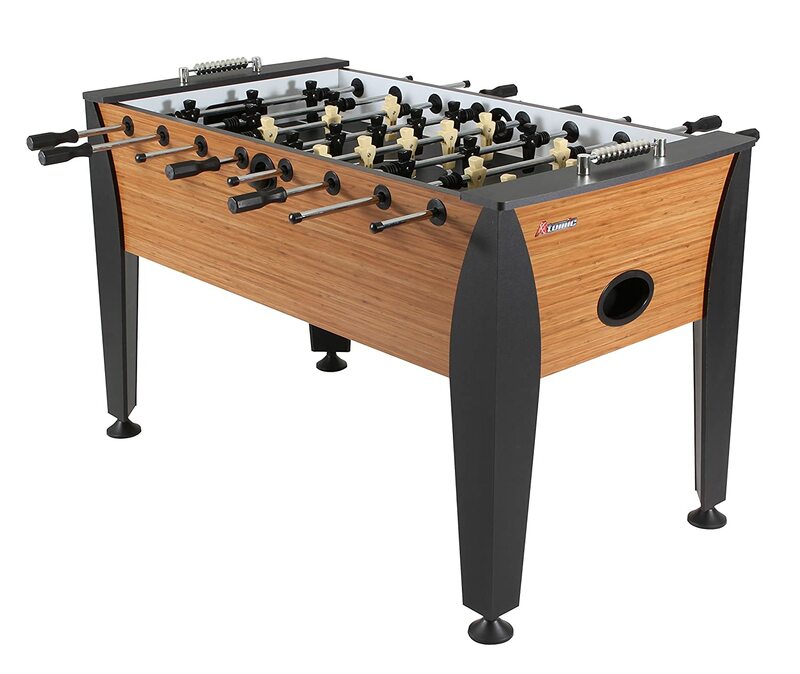 This gorgeous foosball table combines the classic look of a foosball table with elegant features. It’s great if you’re purchasing a table for teens and young adults. Gorgeous chrome features contrast will with the dark espresso finish. Four solid legs with levelers ensure stability as your family plays on the smooth and seamless surface that only comes with a high-quality game table. The playing surface shows a realistic, screen printed grass field with markers. It’s protected by a slick gloss layer that prevents scratches and ensures an even surface with quick, smooth movement of the ball. Solid steel rods glide smoothly through fast, E-Z spin bearings, and lovely solid wooden handels add to the asthetics of this table. At either goal you’ll find a silver toned abucus style scoring system, as well as two stainless steel cup holders. Two soccer-ball style foosballs are included with this unit. While not as elegant, this foosball table still catches the eye with a classy design. This is another table that’s better suited for your preteens, teens, and young adults. It offers eye-catching bamboo laminate, a manual scoring system, three goalie configuration, built-in ball return, and hollow chrome steel rods with comfortable rubber handles. Four foosballs are also included with this unit. It’s constructed from solid MDF and has solid legs with levelers for stability.